A mental vision came to me of a lost little girl in a grocery store, searching for the security of her mom or dad, mistaking a stranger’s leg as that of her parent’s, wrapping her arms around tightly then looking up and realizing her error in judgment, feeling mortified, scared, and more lost than ever and then recognizing her real parent down the aisle and running at break-neck speed into their welcoming arms! I sensed God asking, “Remember when your daughter made that very mistake?” Indeed, I remembered it happening with both of my children on more than one occasion. “And what did you feel toward your child in that moment, Shannon? Anger? Betrayal? Disgust?” God asked. “Of course not. Neither do I feel angry or betrayed or disgusted by your mistakes. You delight me greatly by recognizing and running to me now, and that’s all that matters to me,” our Heavenly Father lovingly explained. We often have fantasies about and run toward many other sources for the comfort and solace that only God can give. And we still end up lost and longing for more than is possible on this side of heaven. But isn’t it wonderful to know that regardless of what we’ve wrapped our arms around in the past, God presently and will forevermore welcome us with open arms! Indeed, He alone can fully satisfy the desperate desires of the human heart. Even mine. And yes, even yours! 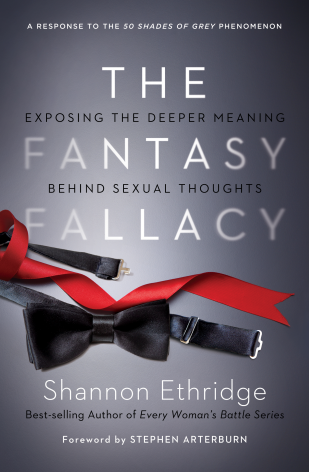 Excerpted from The Fantasy Fallacy: Exposing the Deeper Meaning Behind Sexual Thoughts by Shannon Ethridge. Copyright 2012. All Rights Reserved. Published by Thomas Nelson Publishers, Nashville, TN. Used by Permission. Not to be copied without Publisher’s prior written approval. The final face we need to explore is obviously the most important-that of God’s. As bizarre as it may sound, I believe that if we peel back every layer of every fantasy, what we will discover at the core of our sexual longings is a much deeper spiritual longing. What we ultimately crave isn’t an intimate encounter with flesh and blood that will eventually age and rot. That’s a poor substitute. What we ultimately crave is an intimate encounter with the eternal life-giving spirit of God. We simply will never be satisfied settling for less. Yet sometimes we do. We settle for what this world has to offer us in the here and now, because we lose our vision of what the next world will be like-our perfect heavenly home, where unresolved pain will no longer exist and the gravitational pull of sin and separation from God will no longer have any effect on us. And when we do settle, what is God’s attitude toward us? As He witnesses the plethora of provocative images that prance through our brains, trying to medicate the pain of being a fallen creature living in a fallen world, does His face possess a look of shock? Horror? Disdain? Disgust? Did you catch that? Jesus has walked this earth, wrapped in the same hormonally charged flesh as God has wrapped us in. He’s been here, experienced that gravitational pull. He understands. He sympathizes. He welcomes us into His presence. He offers mercy, grace, and unconditional love. The look on His face is that of sheer compassion.